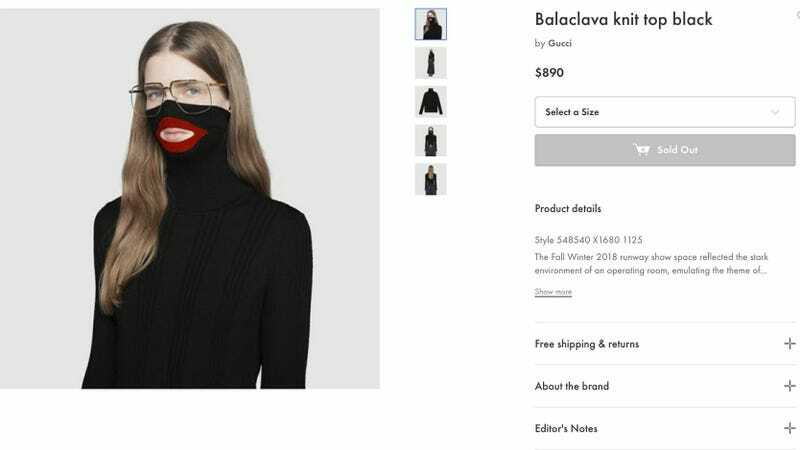 On Thursday, Italy luxury fashion house Gucci posted an apology to Twitter following blackface backlash over its $890 black “Balaclava knit top.” The garment features an exaggerated cloth neckline that pulls up and over the nose, not unlike its namesake headwear, and exaggerated, bright red lips—a textbook example of minstrelsy from the early 20th century. What a Black History Month it has been. Gucci pulled the sweater, writing that the company “deeply apologizes for the offense caused by the wool balaclava jumper,” and “can confirm that the item has been immediately removed from our online store and all physical stores.” A quick search reveals that it’s still available on some third-party online retailers. Gucci isn’t the only major fashion house guilty of utilizing racist imagery in its products. In December, Prada apologized and removed a holiday window display that featured monkey creatures with huge, inflated lips only after getting called out. In November, Dolce & Gabbana cancelled a Shanghai fashion show just hours after racist promotional material appeared on their Instagram account showing an Asian model attempting to eat various Italian foods with chopsticks while a man made jokes about “penetrating” a cannoli with chopsticks. This behavior extends to fast fashion, too: in January 2018, H&M UK pulled a picture from their web store showing a young black boy in a sweater that read, “Coolest monkey in the jungle,” once again, only after outcry.